WBMS promotes academic growth, inspires character, develops problem solvers, and empowers heroes. Woodlawn Beach Middle School is located 30 minutes east of Pensacola, Florida, and 30 minutes west of Destin, Florida. 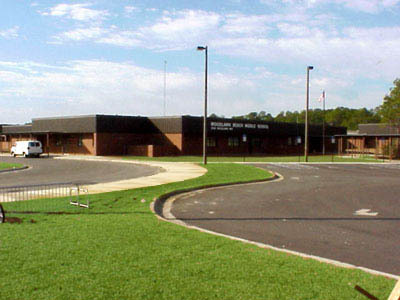 WBMS, one of the newest schools in Santa Rosa County, was dedicated on January 21, 2001. The school property was purchased from PJC and Cypress Triangle and was once a part of the Horace Rogers family home site. The Rogers home was located just west of the school site. At the time of construction, there was a need to fill in two acres of marginal wetlands to make the plan work. The school district and Cypress Triangle offered 40 acres of other wetlands in exchange for the filling of the two acres. The Army Corps of Engineers approved it, but in April 1999, the Federal Fish and Game Commission filed under the Endangered Species Act that the site might be the habitat of the Flatwoods Salamander and required a two-year life study to prove they were not in the wetlands. Rather than delay the school’s opening, the school district and the developer redesigned to avoid all wetlands. The redesign delayed the development of roadways and that is why a temporary road was utilized to open the school. In the August 2000 issue of National Geographic there was an article that referenced a Florida school that missed deadlines due to the protection of the salamander. As of the date of dedication, no one had seen one of the elusive salamanders, and as a result, this school faced the most environmental challenges of any school to date. WBMS currently houses over 1,000 students. The school has full Instructional Television technology, 100mghz state of the art multiple internet connections in every classroom, as well as housing the South End Professional Development Center, which is used to provide training for Santa Rosa School District personnel. Woodlawn Beach Middle School is staffed with nearly 60 teachers, 10 non-instructional staff, and two administrators, along with a support staff of cafeteria and custodial personnel. Additional instructional services are provided by itinerant staff, such as speech and language therapy, occupational therapy, physical therapy, vision and hearing services, ESOL services, psychological services, school social work services, ESE liaison services, and other district support in content areas, professional development, and student services as the need arises. WBMS has a full-time Health Technician housed on the school campus provided for through a district grant. The Lakeview Center, a division of Baptist Health Care System provides overlay counseling to at-risk students through school based referrals facilitated by our Student Services Department. Two of WBMS’s current faculty members have National Board Certification. The administration has 25 years of combined administrative experience in the Santa Rosa County School District. The military has a strong presence in our community because of naval bases located in the Pensacola and Milton area and Air Force bases located in Ft. Walton Beach. Parents and community members provide valuable service to the school through volunteer activities which has enabled WBMS to receive the “Golden School Award” since the school’s opening. This award is based upon the number of volunteer hours being twice the student enrollment during the school year. WBMS received the grade of “A” every year since school grades have been calculated.